You can email me at philter4@d-web.com if you want, I don't always check this site daily so there may be times when I don't read a PM for a few days. My collection is very limited right now, I am living in California but my animals are in Florida so I don't have too many things that can't easily be cared for in my absence. Normally I keep medium and large cats, I have had mountain lion, leopard, several others, but mostly I have cats like golden cat, serval, caracal and leopard cat. All of these are fairly easy to tame down, though none will ever be true pets. I also have several things like binterongs, a couple of antelope, a mother/son pair of zebra that are at a friends house, he has a male and 3 females but they all have the same father and different mothers, so my male is with his female and my female is with his male. Here in California I have a few reptiles, when I was living in San Diego about 15 years ago I had a collection of over 300 reptiles and about 150 amphibians. I have also kept birds, never parrots but exotic game birds. they have to be able to live outdoors, with snow in the winter and take temps in the 100's in the summer. 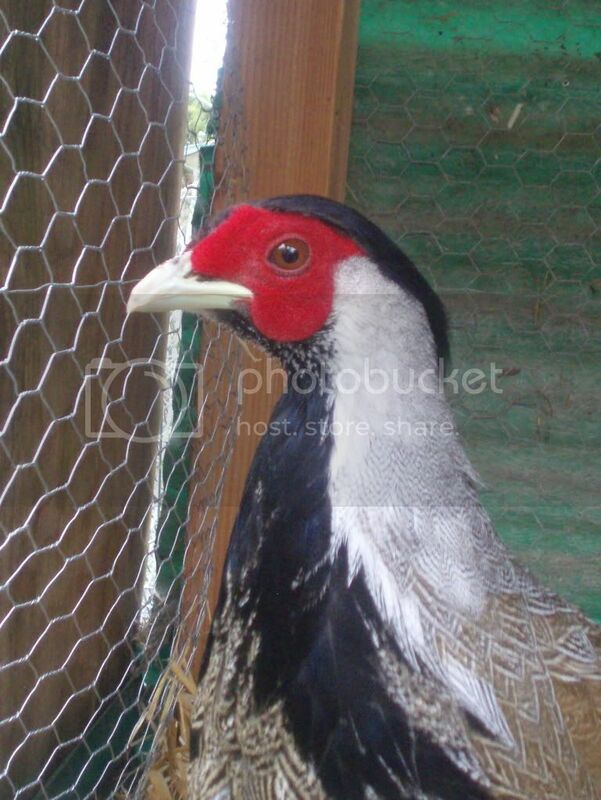 Right now I have 4 different species of Chinese pheasants, Swinhoe's, Lady Amhearst, Reeve's and silver, along with Asian swamphens, grey jungle fowl, Himalayan monals and both helmeted and vulturine guinea fowl. Right now the swamphens, jungle fowl and vulturine guinea fowl are at a friends house because they need some heat in the winter at nights and I am just now adding the heaters and thermostats to the barn where they sleep. I should have them back here by the end of this month. most of my pheasants are only a couple of months old, they are just getting their feathers so I have not taken photos of them yet, but here are a couple of photos of my yearling silver and Swinhoe's pheasants. The other birds here are very young and don't show any color yet, but it will soon be spring and they eclipse molt, where they lose all of the feathers very quickly and they grow new ones just as fast so in a couple of months I will have some great photos of them as well. poison dart frog, both strawberry, dying, and blue. Hopefully I will buy a zoo and have more large animals, like giraffes. This is the last post here from me, so check your emails. P.S. How do I find a red eye tree frog? I have kept several of those species, none of the caged birds, but all of the lizards and insects, and I have two fish tanks with all fish and inverts I have collected myself. My favorites that I don't have any longer are some of the crocodilians. I have had dwarf caiman, but they are only dwarf compared to other caiman, they still get over 5 feet for a large individual, and they are really mean. Several years ago there were a few Nile croc's available from some of the wholesalers, and I have a friend who has both species of gharial available for sale, the false gharial are cheaper at $18 thousand a pair, I can dream can't I!!! He is also the one who breeds all of the white alligators, although now I think some have taken his adults and bred them so there may be others who have some available. Common alligators are easy to come by if you have the permits, and they usually cost no more then $50 apiece plus paperwork to transport the animals which can cost up to $25 per animal. On the dart frogs, the only one you might find easily is the dying, I always called them tinc's (the scientific name is Dendrobates tinctorius) the others are not easy to come by. Almost all of the strawberry frogs are wild caught because of the problems with breeding them, and the blues are all here illegally so most are not shown and very few are ever sold. Some say the blues are the same species as the tinc's just a color variety that has no yellow, others give them species status. I think they are the same because they will easily cross breed and have fertile young that are between both parents in color. On the strawberry frogs I have bred the successfully twice in the past, but the tadpolls are almost impossible to raise because in the wild the mother supplies them with the food and there is no suitable substitute, they eat infertile eggs laid by the mother every couple of days. There is a guy in Hawaii who not only has successfully raised them artificially but because you can not import food insects into Hawaii his frogs produce a toxin in the skin. I am not sure if you know about the toxicity of the dart frogs, but the pretty colorful ones are not very toxic. Once they have been in captivity for a while they lose whatever toxins are in the skin anyway. In the wild they get the toxins from the ants they eat, and in captivity the common ants we have here do not give them whatever it is they need to produce this toxin so they are pretty safe to handle. There are 3 species in a different genus that are very toxic, the genus Phyllobates. The most toxic of these is P. terribilis, and it is usually the one the natives use to tip the darts they hunt with. They are very dull in color, usually yellowish or muddy brown, and they stay hidden a lot but their toxins are strong enough in wild animals to kill humans. For the toxin to work, the animal that bites the frog has to live through the ordeal, if it eats one and dies how is it going to learn not to eat any of the others it comes across? That is why they are very colorful, most animals that try to eat one remember what they taste like and avoid them, but the 3 really toxic ones hide, if an animal happens to try to eat them it will probably not survive, so if they were bright and showy they would both lose, instead they hide as a defense. Still these lose the toxins in captivity just like the other species. Just some interesting facts about some animals I have kept. Finally to find a red eye is more dependent on the time of year, wild ones are collected during the wet season when the males call and they can be located. In the southern areas where they are common the wet season is the summer so look for them starting in May or June and keep trying until they become available. Do not, I repeat, DO NOT buy frogs over the internet, if you don't see them don't buy them. They need to be plump and sleeping when you arrive, skinny or active during the day are bad signs and a sick frog is next to impossible to treat. When they are awake, they should try to escape whoever is holding them, in animals if anything bigger then you picks you up it is usually going to eat you so a frog should try to get away as soon as it is handled. The eyes need to be clear and bright, no rubs or breaks in the skin, especially the nose, and the frog should be sticky as it is put back or if it escapes the clerk trying to hold it, in other words it should not slide off the glass or leaves in the terrarium, not have trouble holding it's position in the tank. These are some of the reasons you want to look at the frog, not just a photo or take someones word on it's condition.